8 THINGS TO BUY BEFORE STARTING MEDICAL SCHOOL - The #1 Guide to the Best Stethoscope! Your dream of becoming a doctor is coming true. You’ve received the admittance offer for medical school – Congratulations! Things are just beginning. Now comes a very steep climb on the path to be a doctor. As soon as you start medical school, from day 1, it’ll be GO GO GO, so start preparing for medical school early. We asked a bunch of doctors and medical students what they would buy in preparation for starting medical school, and made a handy list for you. Every single medical student needs a stethoscope, no question about this. Only, do you need a really good one, or just a good-enough one to start with? It depends on how much money you’re willing to invest at this moment: if you buy a standard one, like the Littmann Classic II SE, it will undoubtedly be good-enough for medical school, but you will eventually need to upgrade before you qualify. It’s up to you to decide whether to invest now or later. Some argue that auscultation skills are hampered unless you use a high-quality stethoscope from the start, others disagree. Read more about the best stethoscope for medical students…. Learning to take a blood pressure is likely the first clinical skill you learn at medical school, and is something that will be tested every single year again and again in clinical exams until you graduate. If you have your own Sphygmomanometer you stand a much higher chance of perfecting this early. Practice at home on every willing subject. The sooner you can take an accurate and perfect blood pressure, the better you will perform overall on your clinical examinations. This doesn’t need to be the best ophthalmoscope on the market. Unlike a stethoscope, depending on which specialization you decide to pursue, you may never need to use one again. Instead, buy a sturdy easy-to-use ophthalmoscope. Ideally one that is interchangeable with an otoscope, which leads us onto…. 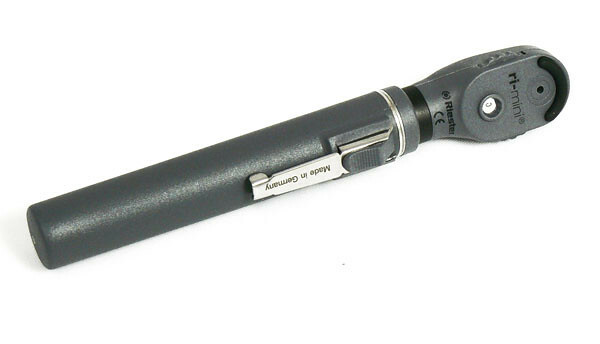 Like an opthalmoscope, buy a simple to use, standard otoscope. One where you can see all of the ear drum and ear canal, and get used to navigating around the ear canal. Medical school is where you’ll become familiar with using an otoscope, and you’ll really start to refine your skill after qualification. If you become a General practitioner (GP) or Family doctor, you’ll be using otoscopes on a daily basis. We recommend buying an otoscope and opthalmoscope set, with interchangeable heads. These form an integral part of any clinical neurological examination, upper limb examination, lower limb examination, and many more. You’ll be expected to start using these very early on. We recommend getting one that’s small enough to slot away in your bag, as it’s one of those things you’ll need at unexpected times. Some might get away with never buying one during medical school, but once you qualify, having your own will save you immeasurable amounts of time. Tendon hammers are notoriously rare on the hospital wards, and having to hunt one down every time you need one – or worse – wait around for a colleague to finish using the shared tendon hammer, takes up valuable time that could be better spent. This is one very few come prepared with, but learn very quickly! Throughout medical school, particularly in the beginning you’ll be on the wards or in clinics just standing around and watching. Possibly for hours. Suddenly those fashionable shoes seem less fashionable and get quickly replaced with comfortable ones. Save yourself the blisters! If you’ve opted to buy a quality stethoscope, you’ll want it to last. (And let’s be honest, even the basic ones are pricey.) Throughout medical school you’ll be throwing your stethoscope around hundreds of times – do yourself a favour and get a case for it. The only thing worse than a battered and broken stethoscope is a lost one…. You’ll use your stethoscope several times a day and every time you put it down is a chance you’ll lose it. Color aside, stethoscopes all look pretty similar, so avoid the potential confusion. We’ve all heard stories of stethoscopes long lost finding their way back t the owner due to the name tag or engraving.